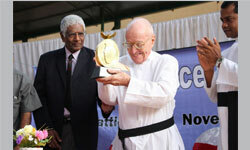 NPC’s Citizens Peace Award was awarded in 2014 to Father Benjamin Henry Miller, an American-born Jesuit priest who has lived in Batticaloa for over six decades. Father Miller founded the Batticaloa Peace Committee (BPC), which began as a group of concerned citizens that gave advice on legal procedures surrounding detention and how to find those in detention. It took up the cases with the authorities, publicised the cases where it might help, and shared the information with international human rights organisations, diplomats, journalists and NGOs. In recognition of its non-partisan role, the security forces gave BPC the role of conduit to hand over released prisoners. The BPC was often called to prisons or courts to pick up released prisoners and the BPC was also named as next-of-kin when there was no next-of-kin available to receive the arrest of new detainees. During the period of ceasefire in 2002 and until its breakdown, the government appointed him to be its nominee for the Sri Lanka Monitoring Mission for Batticaloa. Father Miller showed himself to be a fearless human rights activist who encouraged and strengthened civil society in Batticaloa to take up the cause of the victims of human rights abuses committed by the Sri Lankan security forces and several other militant groups, including the LTTE. During a period of over fifty years when he served as Rector of the St. Michael’s College and as a teacher, Father Miller saw many opportunities to become involved in civic organisations. He helped in the formation of an inter religious organisation and civil societies to combat tuberculosis and cancer through preventive education, the establishment of a branch of the Federation of Red Cross and, as a Rotarian, he served as its President as well as on the National Rotary Council for Peace and Harmony.